It runs from 10.00am to 2:00pm and riders get the chance to have a lesson, learn new stable management skills and just enjoy being around the ponies in the fresh air! We will be running a riding and road safety course here at Barguse Riding Centre commencing Tuesday 28th January. These sessions will run over 6 weeks and will incorporate both theory and mounted sessions culminating with the exam in mid-March. Do you have an under 5 that would like the chance to meet a pony? Every Thursday from 2 – 3pm we run a session especially for little ones where they can come and pet a pony, learn how to groom them and have a ride in our indoor arena. Is your child pony mad? Looking for a different type of birthday party? Want to give your child and their friends a new experience? Then why not try one of our riding parties! Suitable for all ages and abilities including complete beginners, you can tailor your child’s birthday to your own needs and budget! At Barguse, we pride ourselves in producing riders from beginners to advanced. We have a strong junior base and once our junior riders have a solid grounding in the basics we offer them more specialised training in the three disciplines. This is aimed at those riders who wish to develop their knowledge and further their riding skills. It is open to riders who own their own ponies or who wish to use ours. Also, due to the popularity of the sessions for the juniors, we have also opened the dressage academy up to senior riders so they can also benefit. Additionally, we have increased the number of sessions so we have fewer riders in each session and thus each rider has a longer time being videoed. The dressage academy is aimed at both juniors and senior riders who wish to learn in more depth about the German scales of training. This is fundamental in understanding what dressage is all about. The lessons will comprise of both mounted and dismounted work, lunging, video analysis and competition preparation. 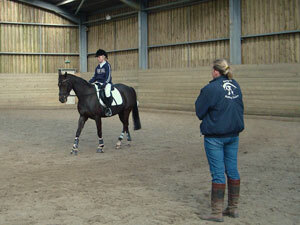 These sessions are taught by Lisa who is a long standing pupil of German dressage trainer, Michael Beining. Lisa spent many years’ under Michael’s guidance learning the art of the correct seat and how your position can influence your horse. It does require discipline to want to achieve the correct way of going without taking shortcuts. She hopes to convey to her pupils that although it’s hard work and at times frustrating, that the benefits long term for both the horse and rider are worth it. That is that the horse develops into a calm, happy, supple and flexible athlete who is willing to work with it’s rider rather than dealing with being pulled and “held” into position! It has to be a more pleasant experience for all concerned! Providing your foundations are sound, the rest will be comparatively easy! These sessions run fortnightly at a cost of £12.50 for the hour. If you would like to attend or just come along to see how it works, please e-mail or contact the office.